News that investment in the State’s major project construction is set to be slashed in half next year is a daunting dose of reality, especially for the resource-intense economies of regional Queensland. The forecast dive, driven by the completion of huge resources projects, will see the value of major projects construction in Queensland drop from $10.5 billion this financial year, to just over $5 billion in 2015-16. But the figures, calculated by the Queensland Major Contractors Association and Construction Skills Queensland, don’t reflect the valuable next strata of construction. While it might not have reached the same dizzying heights as resources construction, public and private infrastructure spending across Queensland has provided a reliable second-tier of support to regional communities. And as the multi-billion resources spend slows, that second-tier must step up. While conventional wisdom might predict the resources slow-down would see other economic drivers get timid, now is the time for regional economies to back themselves and challenge the trepidation. We will seal our own fate if we let our confidence waver, and we have far too much momentum behind to get spooked now. 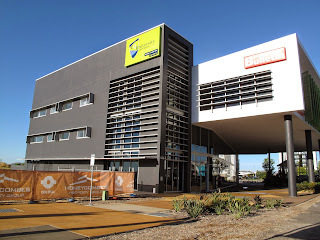 In the past five years, CQUniversity has averaged nearly $20 million a year on infrastructure capital works, with another $6 million a year on technology upgrades atop of that. It’s been an ambitious growth agenda focussed on our faith in the extraordinary potential of our regional communities. And we have no intention to yield to what the pundits are calling the 2015 slow-down. In fact, we plan to do the exact opposite. We have earmarked $44.7 million for new infrastructure projects in 2015, including Rockhampton’s new Health Clinic, new campuses in Cairns and Townsville, modern health education facilities in Bundaberg, expanded Engineering programs in Gladstone, and a new Engineering Centre for Mackay. A further $13.3 million will be spent on technology infrastructure across our campuses this year. In total, our investment across 2009 to 2015 will top $207 million – the vast majority being spent in regional Queensland. True, on paper our investment is small fry compared to the multi-billions of major resources projects. But CQUniversity’s spending on projects developed in close consultation with our local communities will drive huge economic and social change – growing services, employment opportunities, locally-trained workforces, and importantly, confidence for our regions. Our infrastructure spend since 2009 has ultimately seen a huge jump in regional kids going to CQUni, with growth five times that of the leafy inner suburbs of Brisbane. Giving these young people a shot at higher education will pay community dividends for their entire career-span, as they work, raise a family, and invest in their home towns. The closer we get to giving regional kids the same opportunities and experiences as city kids, the closer our communities get to reaching their full potential. This is why I believe regional communities have far more investment bang for buck than the cities. It would be disastrous if we stopped investing in regional Australia because of a shaken confidence in the price of the rocks we dig out of the ground here. We have so much more potential to offer the nation’s sovereign prosperity, and now is the time to back ourselves. No matter who is spending, every dollar of infrastructure investment has the same economic multiplier effect. Whether business, institutions, governments, or the individual consumer, we can all lead innovation and transformation in our regional communities. Anyone who says the value of our regions is exclusively linked to the resources sector simply does not get it. I have no doubt in my mind that regional Queensland is a sleeping giant that is only just starting to stir. Now is the time to back ourselves and give each other the confidence and support we need to not only sustain ourselves, but to flourish, during the year ahead.